We finished our second week with NOMADS (Nomads on Mission Active in Divine Service) at Ocean Park Retreat and Methodist Camp. Our team has accomplished a lot in eight days, there’s a lot to do still. We’re glad we’re here. We really enjoy OPRC. The weather took a little getting used to, with highs in the low to mid-60s and a likelihood of rain every day. The 80 acre campus is just beautiful with mostly woods, a few grassy meadows, and 20 buildings. Jim has had fun building an antenna and a shower step for our trailer (we’ll show you later) in the Center’s maintenance shop. We’ve walked the trails and the beach, and done some sightseeing. We meet each day, Mon-Thu, at 8 am for devotions and discussion and to plan our work day. Work starts at 8:30 and runs until lunch time, then again until 4 pm with coffee breaks mid-morning and afternoon. We’re not using to carrying materials, swinging tools, and just generally working even one day, much less four days. So we’re regarding this as a good form of exercise. We never know what job we’ll land as volunteers. 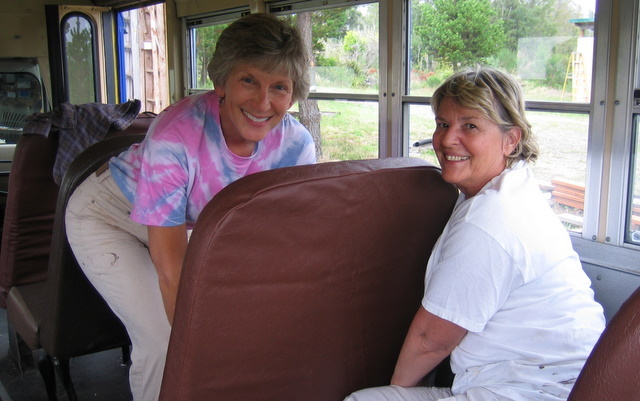 Replacing seat covers in the OPRC bus was a tough job but Debbie, Claudia, and Madeline persisted and did a great job. The new covers are a great improvement for the seats. Outdoor jobs can be great, particularly on cool days with little or no rain. We’ve had lots of cool days but no so many rain-free ones. This was one of our first bright sunny days at OPRC. 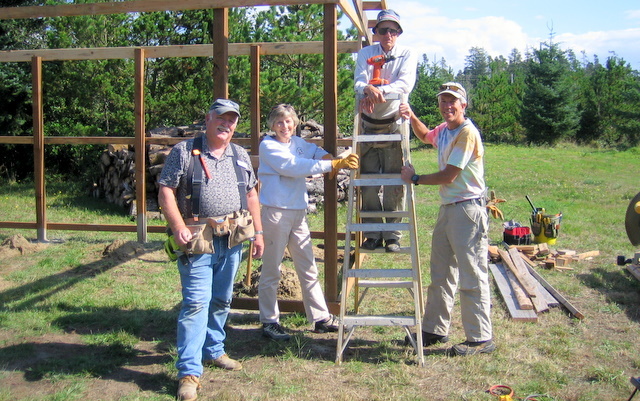 We ran framing around the new wood shed’s posts to prepare for rafters and siding. Jake and Debbie handed sheets up for Ken and Jim to fit and nail. 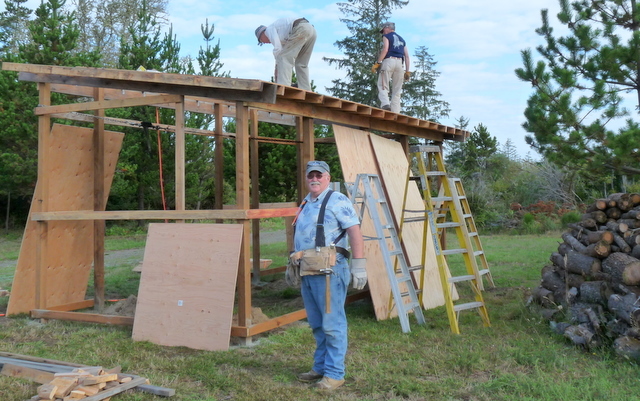 We quickly finished sheeting, tar papering, and started on siding while Ken nailed flashing and battens on the roof. The next day’s forecast is rain. The weather guessers have been correct every day. And we want to have the shed dried in so we can do a little work under its roof. 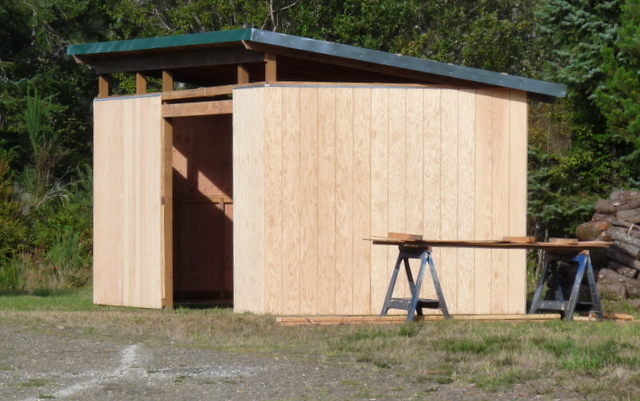 Another day of work and we’ll have this wood shed complete. Pretty nice with posts set in concrete, gravel floor, two doors make an 8′ opening, and room for lots of split and dried firewood. Our final week at OPRC we hope weather will cooperate so we can complete siding, hang the doors, and stain the exterior siding. This was a nice project for our volunteers at OPRC. All work and no play won’t entirely suit this group of NOMADS volunteers. 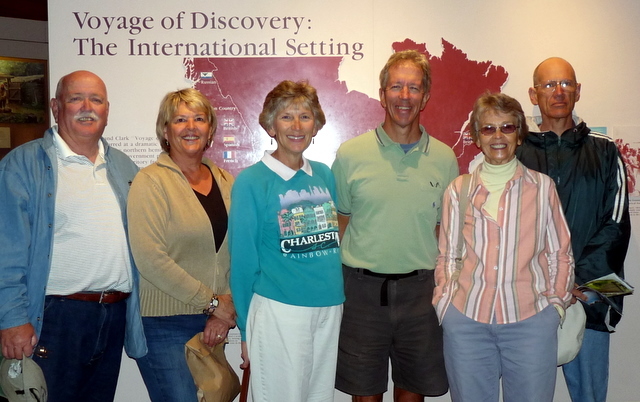 Friday is the beginning of our weekend and the group headed south for a day of touring. We crossed the 4.1 mile Astoria-Megler Bridge to Oregon and followed US-101 to Fort Clatsop then Cannon Beach. This picture is inside the Ft Clatsop visitors center where we enjoyed the displays and a video on the founding of the fort. 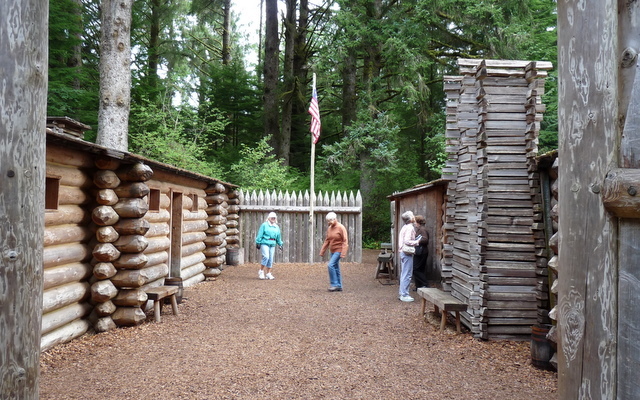 We toured a relatively new replica of Ft Clatsop, the four-month 1805-6 winter home of the Lewis & Clark expedition. The prior replica, built in 1955, burned in 2005 and was recently rebuilt. The Expedition built several forts along their journey and no two seemed alike but each suited the purpose. Unlike many government projects, these forts seemed to waste no space or materials, just did the job. 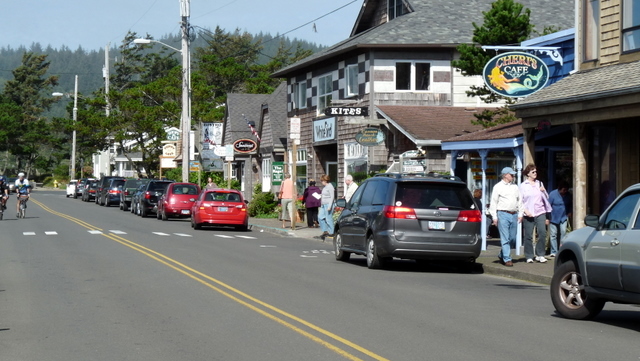 Cannon Beach, twenty-five miles south of Ft Clatsop, is a treat for touring. Lots of candy and toy shops, and plenty of restaurants. We weren’t looking for high cuisine but wanted a nice place to eat. Cheri’s is a nice cafe with good coffee and baked goods and a simple but appealing menu. We enjoyed good food and service at a reasonable price for a tourist town. Lewis & Clark expedition’s winter at Ft Clatsop was very wet, only 12 rainless days out of 106. We’ve done much better during our first two weeks, we’ve had at least four days of sunshine. And a few sunsets like this one we viewed from the main lodge deck at OPRC. The weather was so nice last Monday we celebrated with a campfire and a few roasted marshmallows. 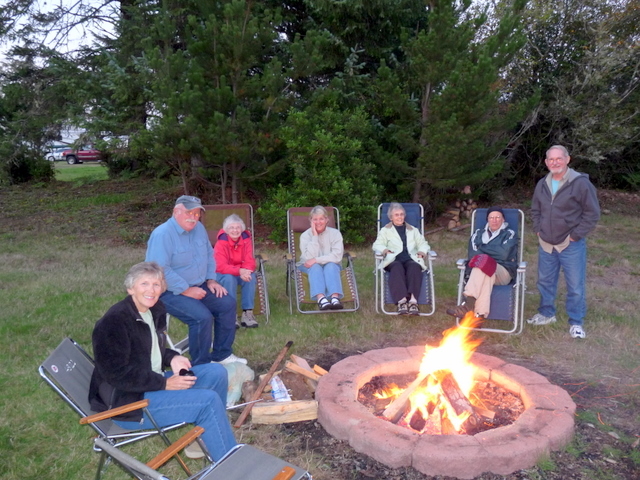 Debbie, Jake, Liz, Claudia, Madeline, Ken, and Len are pictured enjoying warmth from the fire. The fire warmed us for a few hours while we watched the waxing moon rise very brightly in clear skies. We have good work-life balance on this NOMADS project. Jim says we have to eat fresh oysters before we leave. We’ll see if any of our work partners want to join us for this, and Jim hopes we’ll do it regardless. Full-timing makes it easy for us to participate in work projects, dawdle when and where we want, move with the weather. It’ll be time to move southward soon. And we need to start looking at maps and figuring out where’s next. 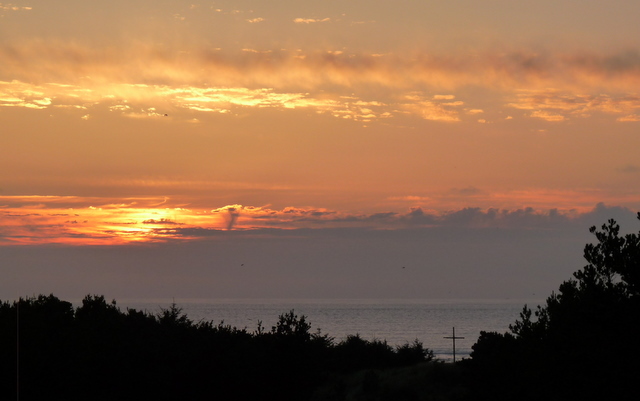 This entry was posted in Full-timing, Sightseeing and tagged Astoria-Megler bridge, Cannon Beach, Fort Clatsop, Ft Clatsop, Full-timing, Jim Cocke, Lewis & Clark expedition, NOMADS, Ocean Park Retreat and Methodist Camp, OPRC. Bookmark the permalink.